Because this is a true story that happened only a few years ago, it’s a story you’re familiar with. So, why see it? Because Danny Boyle directed it, that’s why. As he proved with Trainspotting and Slumdog Millionaire, Boyle as a hyper yet eerily focused way of cutting his movies together. The screen cuts into thirds, the music blares, the camera swoops down and under and over and out, and then, maybe, everything slows down to fit in some dialogue. But most of 127 Hours’ 90 minutes takes place in one unmovable location, so it must be slow, right? Not a chance. Why? Because of Boyle’s supreme eye for the craft of cinema. He’s like Stanley Kubrick on coke (and maybe a little acid). Once the ballsy, arrogant Aron Ralston found that his right arm was wedged perfectly between two rocks, he quickly, and resourcefully, began using the materials at his disposal to free himself. He rationed his water and food, attempted to construct a pulley, recorded his dying thoughts onto his video camera, and so on. But it was the cheap, dull knife that eventually gained him his freedom. There’s a few things, aside from Boyle’s technique, that make 127 Hours one of the very best films of this year. First is James Franco. In a career that has amounted to the uselessness of the Spider-Man trilogy and other duds with titles like Annapolis and Deuces Wild, Franco has impressed me in one role, that of Sean Penn's lover in Milk. Mostly, he has under delivered in bad movies, and never did I expect him to floor me as he did here. As Ralston, Franco is an utter revelation. It’s hard to describe this performance without getting weighed down with fancy adjectives. And honestly, there’s no need. His performance – the anguish, the exhaustion, the frustration, the humor, the paranoia, the delusion – it’s just that good. I don’t believe I’ve seen better acting so far this year. 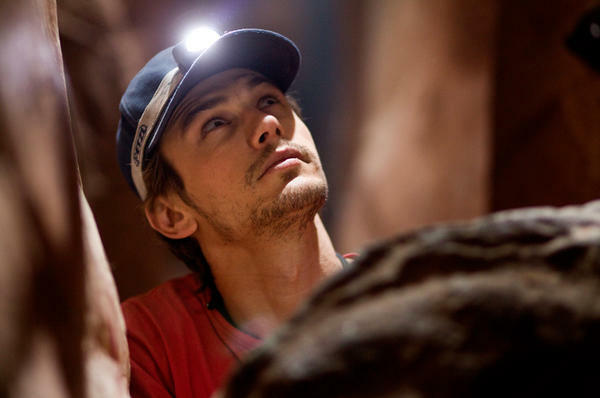 Reports have been springing up consistently of people fainting at 127 Hours screenings (Franco and Ralston actually observed a few people pass out at a screening they attended), and why is this? Why is it that we can laugh and pay a film like Saw and Hostel no mind, but we actually pass out in 127 Hours? The answer is simple: because we actually care about a film as good and well done as 127 Hours. We care what happens to Ralston, we care how Boyle and Franco handle the final hazy, uplifting moments. We care because we’ve invested time and energy and compassion, not just money. We care, because it’s good, really good.